, a learned German grammarian, and miscellaneous writer, was born Aug. 30, 1734, at Spantekow, in Pomerania; and after studying some time at Anclam and Closterbergen, finished his education at the university of Halle. In 1759 he was appointed professor of the academy of Erfurt, which he relinquished about two years after, and settled at Leipsic, where, in, | 1787, he was made librarian to the elector of Dresden; and here he died of a hemorrhoidal complaint, Sept. 10, 1806, aged 72, aocording to our authority; but the Diet. Hist, fixes his birth in 1732, which makes him two years older. Adelung performed for the German language what the French academy, and that of De la Crusca, have done for the French and Italian. His “Grammatical and Critical Dictionary,” Leipsic, 1774 1786, 5 vols. 4to, a work of acknowledged merit and vast labour, has been alternately praised and censured by men of learning in Germany; some say that it excels Dr. Johnson’s dictionary of the English language in its definitions and etymologies, but falls short of it in the value of his authorities. This latter defect has been attributed either to the want of good authors in the language at the time he was preparing his work, or to his predilection for the writers of Upper Saxony. He considered the dialect of the margraviate of Misnia as the standard of good German, and rejected every thing that was contrury to the language of the better classes of society, and the authors of that district. It was also his opinion that languages are the work of nations, and not of individuals, however distinguished; forgetting that the language of books must be that of men of learning. Voss and Campe in particular reproached him for the omissions in his work, and his partiality in the choice of authorities. 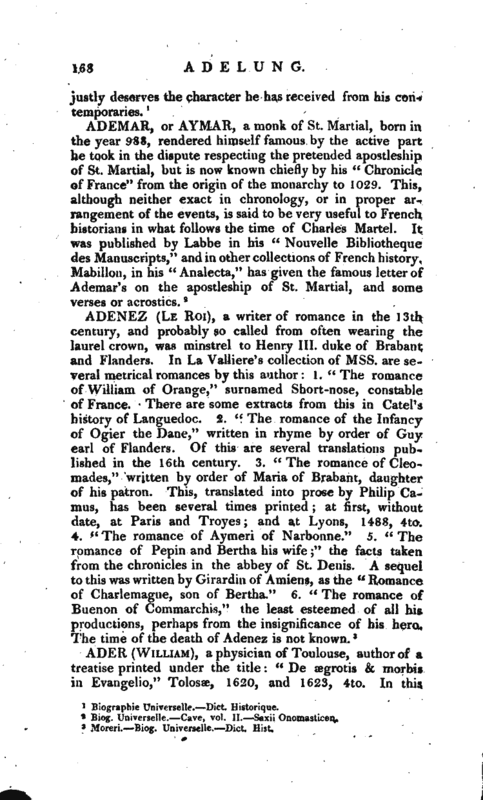 In 1793—1801, a new edition appeared in 4 vols. 4to, Leipsic, with additions, but which bore no proportion to the improvements that had been made in the language during the interval that elapsed from the publication of the first. 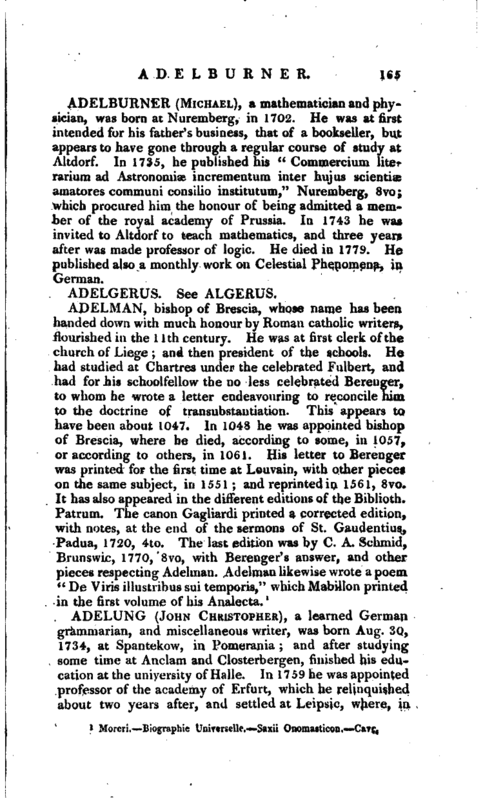 Adelung’s other works are: 1. “Glossarium manuale ad scriptores medii et infimae Latinitatis,” FJalle, 1772 84, 6 vols. 8vo, an abridgement of Du Cange and Charpentier. 2. 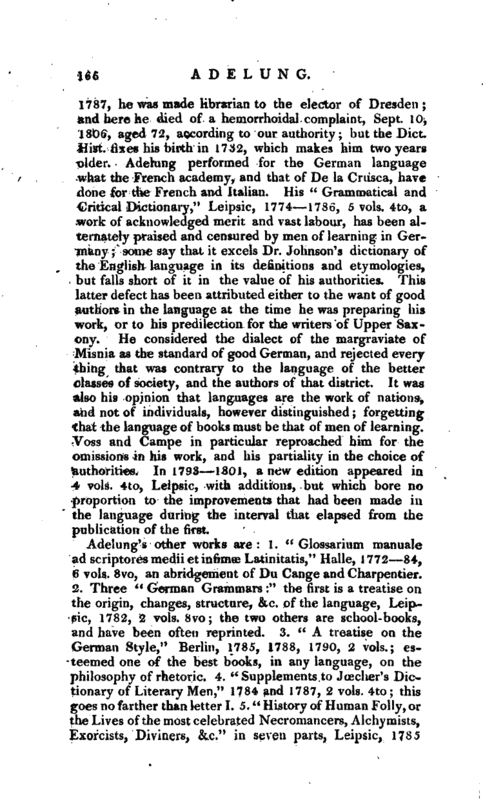 Three “German Grammars:” the first is a treatise on the origin, changes, structure, &c. of the language, Leipsic, 1782, 2 vols. 8vo; the two others are school-books, and have been often reprinted. 3. “A treatise on the German Style,” Berlin, 1785, 1788, 1790, 2 vols. ; esteemed one of the best books, in any language, on the philosophy of rhetoric. 4. “Supplements to Jcecher’s Dictionary of Literary Men,” 1784 and 1787, 2 vols. 4to; this goes no farther than letter I. 5. “History of Human Folly, or he Lives of the most celebrated Necromancers, Alchymists, Exorcists, Diviners, &c.” in seven parts, Leipsic, 1785 | to 1789. 6. “A species of Cyclopedia of all the Sciences, Arts, and Manufactures, which contribute to the comforts of human life,” four parts, Leipsic, 1778, 1781, 1788; a work of great accuracy, and very comprehensive. 7. “Essay on the history of the Civilization of Mankind,” Leipsic, 1782, 1788. 8. “The history of Philosophy,” 3 vols. ibid. 1786, 1787, 8vo. 9. “Treatise on German Orthography,” 8vo, 1787. Many of the best German writers, and Wieland among the rest, have adopted his principles in this work; and their example, in the opinion of his biographer, may supply the want of the decisions of an academy, or national centre for improvements in language. 10. “The history of the Teutones, their language and literature before the general migration,” Leipsic, 1806, 8vo. 11. “Mithridate, or a universal table of Languages, with the Lord’s Prayer in one hundred languages,” Berlin, 1806, 8vo. 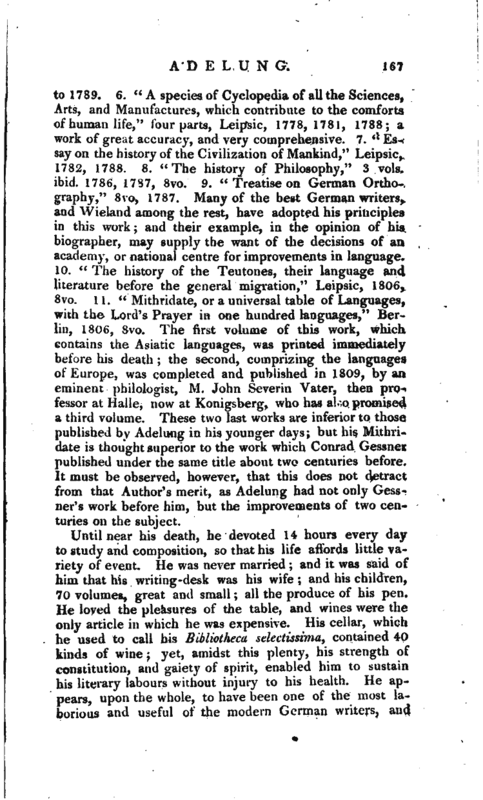 The first volume of this work, which contains the Asiatic languages, was printed immediately before his death; the second, comprizing the languages of Europe, was completed and published in 1809, by an eminent philologist, M. John Severin Vater, then professor at Halle, now at Konigsberg, who has also promised a third volume. These two last works are inferior to those published by Adelung in his younger days; but his Mithridate is thought superior to the work which Conrad Gessner published under the same title about two centuries before. It must be observed, however, that this does not detract from that Author’s merit, as Adelung had not only Gessner’s work before him, but the improvements of two centuries on the subject.